It's a villain origin story. OF COURSE I want to read it. I initially dismissed this one because the title and the cover and the synopsis do nothing for me. But everyone says this book is ridiculously adorable, so I'm rethinking my stance. Hello, dragon book. Come to mamma. I had this one on my radar even before it was released. It looks so good! A friend recommended this to me, and I almost always read recommendations from others! The cover reminds me of Graceling, plus she's a local author. Must. Read. Faster. A friend who generally prefers nonfiction read this and loved it. Which told me everything I needed to know. I now own it, but haven't read it. YET. It's been on my nightstand for months. What did you mean to read last year that you haven't yet? Which of these should I read prioritize?? I'm hoping to get to All the Boys I have Loved Before this month. I can't believe I did read it in 2014. I know, all the positive reviews have me bumping it up on my to-read list as well. Fun list! I'm hoping to read The Young Elites and To All the Boys... too. Oh yay! We'll have to compare notes. My list could have been a lot longer as well. I really want to read The Young Elites. I should have put that on my list. Gah! 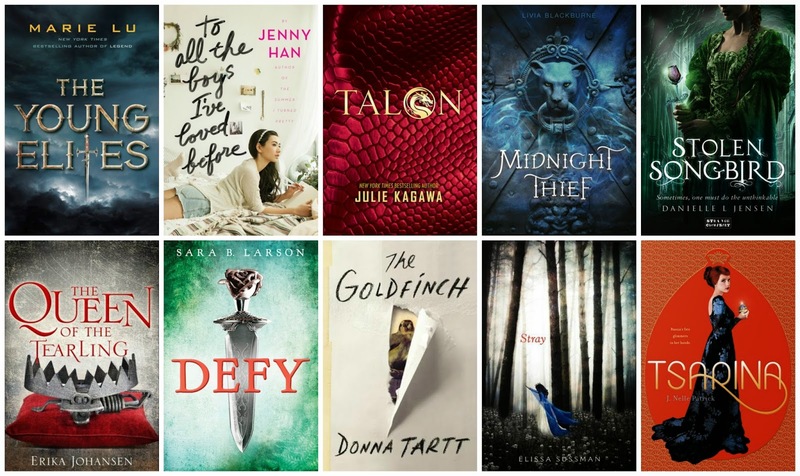 I just added a few of these on my TBR list! Oh good! I'm looking forward to see if we have the same reactions. Great list. The Young Elites is on my top ten list of books I meant to watch last year as well. I did read The Goldfinch and LOVED it. It did move slowly at times, but still it was a really good read. I'm thinking my comment didn't go through. Dangit. I should probably stop waxing poetic about "The Goldfinch" so that your expectations aren't so high. Have you read "Ethan Frome?" Because it reminded me of that one in some ways, even though "Ethan Frome" is like 100 pages and "The Goldfinch" is so huge that I have to hold my Kindle with both hands. I hate it when my comments get lost. I'm usually too resentful towards the internet to rewrite it. Props to you for retyping. Haha, don't worry about the overhype!! This book won a freaking Pulitzer, so there is plenty of hype around it anyway. I am just so curious about it, I really do want to read it. YES! Edith Wharton!! Read it on a gray, depressing day. I think it's absolutely brilliant. That book made me realize that I might actually like fiction (ha). YES. I absolutely adore Edith Wharton. I should have read it today: it was horribly gray all day. I'd like to read The Young Elites and Midnight Thief at some point, too. Just need to buy copies of them first. *lol* I've also heard good things about Stolen Songbird, so that's a possibility. This one isn't on your list, but I haven't read Sara Raasch's Snow Like Ashes yet. It sounds good, though I'm not crazy about another love triangle, but that's just me. I haven't read Snow Like Ashes! All I know about it is that it is a Snow White retelling, which is a good thing, and that it has a love triangle, which is a bad thing. To me, anyway. I do love me a good fairy tale retelling though, so I might read it anyway. 2014 wasn't much of a reading year for me, so I wouldn't say I meant to read anything and didn't but I do want to get to To All the Boys I've Loved. Hope you enjoy when you do read it! I've heard nothing but ridiculously good things about it. I read Tsarina, The Midnight Thief and To All the Boys I've Loved Before last year! Out of all three, I think To All the Boys I've Loved Before was my favorite, it was just so adorable! I read Stolen Songbird this month and enjoyed it as well. All of the others are basically on my to-read shelf as well. I hope you like Defy when you get to it. I really enjoyed it and can't wait to read Ignite, the second book. I started reading The Goldfinch early last year, then put it down and never got back to it, but it's definitely on my list of books to finish for this year! It is pretty long, so it might not be a bad idea to take it in segments. I might do the same thing. We'll see!